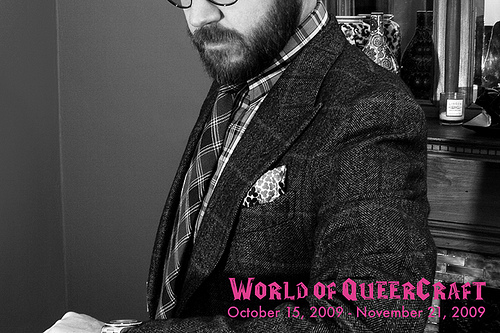 World of Queercraft is a group gallery exhibit featuring work by eight queer-thinking artists from Providence, New York, and Chicago. Lively and colorful, the work by each of these individuals explores craft in a different way, from textiles and collage to print and video. There will be rainbows and Barbra Streisand, but there will also be teapots, karaoke, candy, a lawnmower, and at least one allusion to DH Lawrence. Curated by Matthew Lawrence, the show features work by Liz Collins, Michael DiPietro, Steven Frost, Monica Panzarino, Christopher Schulz, Anna Shapiro, Jason Tranchida, and Matt Underwood. The show runs October 15 through November 21. The opening will take place October 15 (Gallery Night) from 5-9pm. Craftland is now a year-round store at the corner of Westminster and Union Streets in downtown Providence.